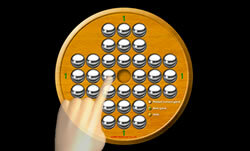 Peg solitaire is a traditional game for one person that has been known and loved for the past 200 years. A modern version of a classic pastime, this app is even more fun than the original! Seven-Challenge Peg Solitaire has a beautiful classic look, and with seven different patterns–all the patterns you find in traditional solitaire–you’ll never get bored. The rules are easy: all you do is jump over the piece next to you to eliminate that piece. Still, victory isn’t that simple: you’ve got to get down to just one piece on the board in order to call it a win. Each new game starts with one blank spot, and the position of this spot differs with each pattern. Since the game is symmetrical on top/bottom and right/left, once you’ve got all seven, you dominate the entire board of 33. That’s right! If you get through Seven-Challenge Peg Solitaire, you are truly a master of the game.Buy Now!